The plan for the day was to hike the coast and explore the other three towns in Cinque Terre. The hotel had a skimpy breakfast. Additionally, the staff at the hotel was not the most helpful. Morgan was convinced that the older woman at the front desk understands English pretty well, but pretends that she doesn't. While I had got a 7 day internet day for the wireless, the older woman kept giving Morgan 1 hour passes and it was making her a little crazy. After breakfast, we walked to the train station, got Morgan a hiking pass and took the train to the Corniglia, the next town. It was a 382 step climb from the train station up into the hilltop town. Corniglia is the only one of the five towns that is not on the water. 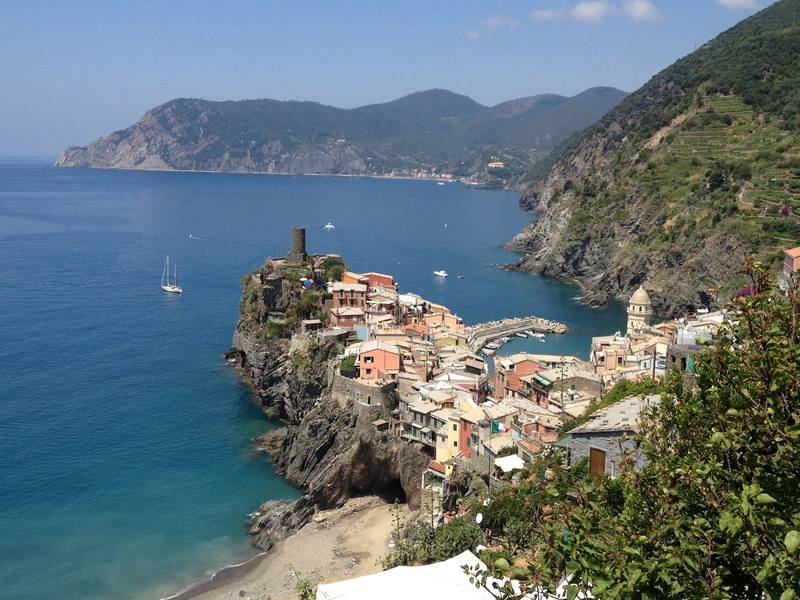 We hiked the trail from Corniglia to Vernazza. It is a beautiful 2.5 plus mile hike along the coast with some great vistas. It took us about one hour and 45 minutes. Once we got to Vernazza, we had lunch at Ristorante Belforte. The restaurant was located in a tower at the end of the town overlooking the harbor. The food was great. We had a mixed seafood appetizer again and I had some pasta with pesto. After lunch, we caught the train from Vernazza to Monterosso. The last town of the five has the best beaches. We rented a couple of beach chairs and umbrellas and spent a couple of hours swimming in the Mediterranean Sea and reading our books. Lying on the beach is something that we never do. From the water, you could see the other four towns south along the coast. At one point, I wandered into town and bought tickets for the ferry. We caught the 5:50 pm ferry back to Manarola. It was a gorgeous view of the coast from the water. 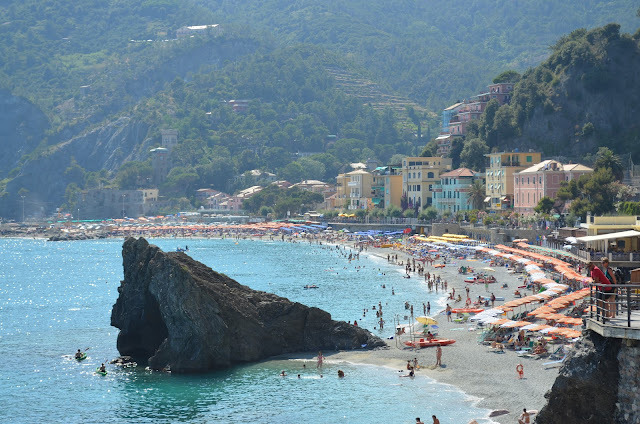 The coast in Cinque Terre is very different than the Amalfi Coast; Cinque Terre looks more like the California coast. While Sharon and the kids took a short nap, I sat on the balcony worked on the trip notes with a glass of wine. It was a cool view of the town. We finished the day with dinner close to our hotel in Manarola. I need to figure out the name of the restaurant. While the food was not quite as good as the previous three meals, it was still good. I had swordfish. With a very, very early day planned for Friday, we got everyone to bed as early as possible.